After months of rumours, tantalising clues from Samsung mobile boss DJ Koh, and a heavily-disguised prototype unveiled to rapturous applause at the firm's developer conference in November, the Galaxy Fold is finally ready for the big time. The Galaxy Fold, which has six cameras, two displays, and an all-new folding screen, was first revealed in its entirety in a polished product video during Samsung's Galaxy Unpacked event in February, when the company also launched its Galaxy S10 range and new Galaxy Buds wireless earbuds. Since then, the firm has stayed shtum about the foldable wonder, happy to let the Galaxy S10 series take the spotlight. Until now. Pre-orders for the £1,800 ($1,980, €2,000) Samsung Galaxy Fold will go live on Friday April 26, 2019 before the pliable handset hits shelves worldwide on May 3, 2019. Ahead of the launch, T3 spent some time with the Galaxy Fold. What follows is our initial Samsung Galaxy Fold review – our first impressions after spending an hour or so with the all-new phone. When we've spent a lot more time with the handset, we'll follow this early verdict review up with a full, in-depth review along with a final score. After unveiling the Galaxy Fold during its Galaxy Unpacked presentation, Samsung stayed suspiciously quiet about its Galaxy Fold handset. It even went so far as to lock the £1,800 handset away in a glass box to avoid all contact with human hands on its stand at the MWC tradeshow in February. As a result, we steeled ourselves before we picked up the Galaxy Fold this afternoon, fully prepared for the handset to feel like a prototype. Thankfully, it didn't. It didn't at all. Those hoping to place an order next week will be pleased to know the Samsung Galaxy Fold feels like a finished product, with the same polish and fit-and-finish that we've come to expect from the Seoul-based company's flagship hardware. Opening and closing the Galaxy Fold is accompanied by a satisfying snap. When closed, the folding 7.3-inch Infinity Flex Display is held in place with some surprisingly strong magnets. As a result, unfolding the AMOLED display – which unfurls like the pages of paperback bestseller – is a very deliberate act. Don't worry, there's no way the Fold will accidentally click open in your handbag or rucksack. When you snap open the magnets, the Galaxy Fold falls open to a 140-degree angle on its own. To lock-out the touchscreen into its full 180-degree position, you'll need to apply a little pressure to the dual axis hinge, which rewards you with a reassuring clap as the screen becomes completely flat. This mechanism, which is designed to improve the durability of the Infinity Flex display, feels incredibly solid. After a few very tentative folds when we first picked-up the device – unfurling the handset as if we were handling an origami model constructed entirely of wet tissue paper – we soon started to happily snap shut the Galaxy Fold to add emphasise to whatever we were saying, and casually flicking it open and closed absentmindedly, like a fidget cube. We even tried to click open the Galaxy Fold one-handed, which definitely does work, but also incurs a high risk of dropping it on the floor. Samsung says its new handset can withstand 200,000 folds without any impact on the Infinity Flex display. That means you'll be able to fold the Galaxy Fold 100 times a day for the next five years. Mind you, based on our brief time with the device, you're likely to hit the 200,000 total much quicker than that because it's just so much fun the Galaxy Fold snap it open and shut. Unlike the Huawei Mate X, which folds its touchscreen around the outside of the handset, the Galaxy Fold opens like a book, or a laptop. Samsung told us that it settled on this design – after no fewer than 1,000 different prototypes over the last decade – because it felt like the "most natural" way to unfold a device. Whatever else you think of the design, we're inclined to agree: it really does feel like natural, and unfurling the screen becomes second-nature in a matter of minutes. Another advantage of this approach is that the Infinity-Flex display is protected from scratches and scuffs when it's folded away safely inside the handset. That's not something that can be said about the rival Huawei Mate X, which keeps whatever portion of the touchscreen you're not using on the back of the handset – ready to make contact with whatever surface you're resting your smartphone on. That said, the approach taken by the Galaxy Fold isn't without drawbacks. Keeping the folding screen on the inside requires an entirely separate 4.6-inch Cover Display that sits on the outside of the device so that you can answer phone calls without holding a 7.3-inch tablet to the side of your head. Samsung says it decided to use a 4.6-inch Super AMOLED because it makes the screen perfect for one-handed use, which sounds like it makes sense until you see the colossal bezels that sit above and below the screen. It's a tremendous eyesore. Not only that, but the display feels really lanky and typing on the keyboard takes some practice, as the screen is so thin. We'll need to spend some more time living with the Galaxy Fold, but we'd wager that most people will just default to the gorgeous 7.3-inch folding display – only resorting to the Cover Display when they get a phone call, or are so squished in the tube carriage during the morning commute that they have no choice. It's also worth noting that the titular fold means the Galaxy Fold is pretty chunky – and can often times feel like holding two flagship smartphones sandwiched together, rather than a single device. Not ideal. And what about the dreaded crease? In a nutshell: yes, there is a visible crease down the middle of the Infinity Flex display when it's unfolded. When you're using the Galaxy Fold and looking directly at the gorgeous AMOLED HDR10+ display it's not noticeable at all. We watched multiple YouTube videos on the device, scrolled through web pages and photos and couldn't pick-up a wrinkle or ridge in the screen. However, if you're looking at the 7.3-inch Infinity Flex off-centre it's eye-spankingly obvious and looks a little unsightly. How much this bothers you really depends on how much you value the viewing experience of the nosey people sat beside you on the train, craning their necks to watch your Netflix boxset during the morning commute. Rather disconcertingly, you're also able to feel the crease in the screen when you run your fingertip across the middle of the display. It's very odd, especially since the AMOLED feels so solid and taught. But it's a small price to pay for the ability to carry around such an expansive screen in your pocket at all times. On the back of the all-new smartphone is a triple-camera system, with another two on the inside above the 7.3-inch AMOLED display, and finally, a single selfie camera on the front of the device. That's a total of six cameras on a single device, which is a lot. The triple-camera on the back is the same set-up as the Galaxy S10 and the Samsung Galaxy S10 Plus – but misses out on the next-generation quadruple-camera of the forthcoming Galaxy S10 5G. The triple camera combines a 16MP ultra-wide camera, a 12MP wide-angle sensor which can vary automatically between f/1.5 and f/2.4 based on the light conditions in the room, and a 12MP telephoto camera. The latter enables the same 2x optical zoom as the other handsets in the Galaxy S10 range. Galaxy Fold also supports Live Focus photographs – the adjustable, artificial bokeh-style blur added to the background behind the subject of the image. The dual-selfie cameras in the corner of the 7.3-inch Infinity Flex display are the same as the front-facing cameras on the Galaxy S10 Plus, so you'll be able to capture the same bokeh-bursting snaps as the non-foldable flagship. The single lens on the front of the device, housed above the 4.6-inch Cover Display is an all-new 10MP shooter with f/2.2. Unfortunately, we didn't get a chance to test out any of the cameras during our brief time with the Galaxy Fold, although we'd expect to get the same high-level of performance as we saw with the Galaxy S10 range. Powering the device is a 7-nanometre processor, coupled with 12GB of RAM. There’s 512GB of built-in storage, and no MicroSD card slot if you were hoping to expand the storage that way. Samsung has fitted the Fold with a 4,380mAh battery – or rather, two batteries – which are split on either side of the hinge. Galaxy Fold is capable of recharging itself as well as a second device via Wireless PowerShare while connected to a regular USB-C charger, so you can leave your second charging cable and wall plug at home. With the launch of the Galaxy S10 range, Samsung overhauled its mobile OS. Gone is TouchWiz – the grotesque Samsung-designed Android skin that has appeared on all of its smartphones since June 2010 – replaced instead with One UI. This is a new Android Pie-powered mobile OS acknowledges the difficulties with handling a large-screen device one-handed. To resolve that, it shifts the interactive elements of the user interface to the lower-third of the screen where they can be reached without difficult thumb gymnastics. It has already appeared on the Samsung Galaxy S10e, Galaxy S10, and Galaxy S10 Plus and is fast-becoming one of our favourite Android skins out there. With the Galaxy Fold, Samsung has introduced a number of unique software propositions, including the ability to run three apps simultaneously on the 7.3-inch display. Thanks to the 12GB of RAM purring under the bonnet, all three apps are running live too – Samsung doesn't freeze anything when you're not actively interacting with another window. As such, you could be in the queue for tickets for a gig, while texting a WhatsApp group to see whenever anyone else has managed to secure a seat, and scrolling through a playlist from the band in question on Spotify. All at the same time. Not bad for a device that fits in your pocket, eh? You can run three separate browser windows at the same time, too. That's the kind of feature that makes this a genuine mobile productivity machine. One thing that was a little odd is that Samsung currently only supports the ability to split the screen vertically when multi-tasking with two apps. Not horizontally, which would be much, much better when watching a video and doing something else. It's not a big deal, and will likely be tweaked in a future update. Another slightly odd quirk is the shutter button is shifted to the middle of the right-hand side when you launch the viewfinder on the 7.3-inch Infinity Flex display. Samsung says this makes taking a photo more natural, and something that can be done one-handed. But it's weird there's no open to flip the orientation over for lefties, who will have to make do using their right thumb to shoot for now. The other major improvement is called App Continuity. This allows you to move from the Cover Display to the Infinity Flex display without interrupting what you're doing. So, if you plan a route on Google Maps using the expansive 7.3-inch display, then fold your phone, the directions will appear on the smaller Cover Display right where you left them no sooner that you hear the magnets safely snap into place. It's seriously impressive stuff. We tried to trick the software a few times, seeing whether it would keep our place in a list on Spotify (it did), and whether half-drafted messages in WhatsApp would safely make the journey between screens (they did). Samsung has clearly really thought about this stuff. If you're speaking to somebody on the phone and decide to unfold the Galaxy Fold, your call will automatically be switched to loudspeaker, because Samsung knows you're never going to want to hold the massive 7.3-inch display to the side of your head and shout, like Dom Joly. The Galaxy Fold has a slew of small tweaks and touches like this, which all add up to ensure the next-generation handset feels like something that engineers have lived with and discussed. This isn't a concept that was rushed together to show-off the pliable AMOLED technology, this feels like much, much more. Samsung says it has updated all of its applications to support App Continuity, while Google has tweaked the "majority" of its apps. There are some third-party software, like Instagram and Spotify, which have also been updated, but early adopters are likely to be in for a wait before all the apps they use day-to-day support the feature. Likewise, the curved notch in the top right-hand corner of the Galaxy Fold screen, which houses the dual selfie cameras, did cut-out the corner of a few apps that we loaded up. This little quirks will undoubtedly be fixed in no time after the handset launches, but it's something to keep in mind if you're going to be one of the first to own an entirely-new category of smartphone, like this. Samsung Galaxy Fold will be available to pre-order exclusively from Samsung's online store, brick-and-mortar "Experience Stores" and carrier partner, EE. The company has promised a "premium" white-glove hands on experience for those who want to try-out the pliable phone for themselves before coughing up the cash. It's clear that Samsung really wants the Galaxy Fold to feel like a premium experience. The new eco-friendly packaging has been redesigned from the ground up and looks completely different to the boxes that contain the Galaxy S10. To make amends for ditching the 3.5mm headphone port, Samsung is throwing in a pair of its all-new AirPod rivalling Galaxy Buds in the box. There's also a svelte Samsung-made case to protect your device, and one year of Samsung Care+, which insures your handset against accidental damage. Samsung also bundles a four month free YouTube Premium subscription in the box, too. As for a Samsung Galaxy Fold release date: pre-orders for the £1,800 ($1,980, €2,000) Galaxy Fold will go live on Friday April 26, 2019 before the pliable flagship hits shelves worldwide on May 3, 2019. 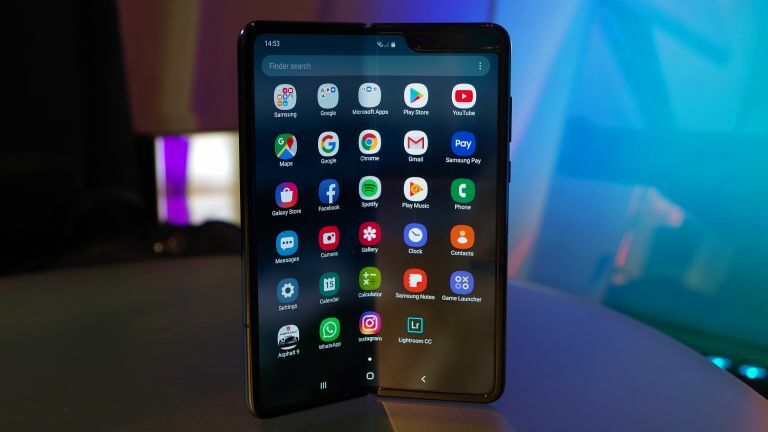 April 18, 2019: Some reports have started to emerge about issues with folding screen on the first batch of Samsung Galaxy Fold handsets. While we experienced no issues during our brief time with the Galaxy Fold, some outlets have reported seeing glitches in the screen – and even total failures of the 7.3-inch Infinity Flex display in the first few days of testing. It appears some reviewers mistakenly removed a thin protective layer on the pliable screen, which does look like a conventional screen protector, and inadvertently weakened the display. In a statement, a spokesperson for Samsung US said: "A limited number of early Galaxy Fold samples were provided to media for review. We have received a few reports regarding the main display on the samples provided. We will thoroughly inspect these units in person to determine the cause of the matter.